Vetter, a leading contract development and manufacturing organization (CDMO) committed to providing customers with the manufacture of high quality drug products, announced today that following approximately two years of construction, its Schuetzenstrasse multi-functional building has been completed on schedule and departments critical to its operation have started to move in. The 29 million Euro investment in the new building is part of a 300 million euro total investment strategy announced by the company in September 2015 for further development to its manufacturing sites, and to make available additional manufacturing capacities. 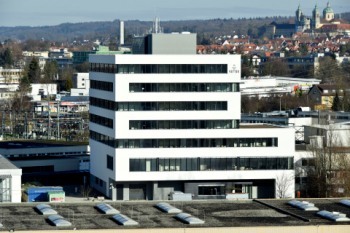 The Schuetzenstrasse building itself is in response to an increase in demand by customers for support in drug development, as well as the need for enhanced IT systems to meet future customer and regulatory requirements already being seen today. Vetter supports many of the world’s leading pharmaceutical and biotech companies from development through to manufacturing and final packaging of their drug products. The continued demand by its large and small customers for enhanced drug development services, as well as the need for ever-more future-oriented sophisticated IT systems to protect their data, created the need for the new 8,500 sqm (91,500 sq. ft.), six-story building. It contains non-cGMP laboratories for development support, laboratory space for microbiological analysis, office workplaces for Vetter Development Service and IT as well as in its core, a data processing center with enhanced security systems, including a safety cell that protects technology and data from external physical hazards in the event of an emergency. "With the installation of these future-oriented IT systems, we are early-on addressing the need for increased connectivity between customers and their manufacturing partners, like Vetter, to efficiently share and store data without concern for its safety,” said Oliver Albrecht, a Vetter Managing Director. “The new building is further evidence that Vetter is well-prepared to meet present and future industry challenges and requirements." Managing Director Thomas Otto added, "With this building, we are meeting the growing demand of our customers for drug development support. The investments in both our Development Service capabilities and our IT system reflect two of the core aspects of Vetter’s orientation as an innovative Contract Development and Manufacturing Organization." 2015 was another successful year economically for the company as evidenced by a growing customer demand for projects in clinical development, commercial manufacturing, and final packaging, a result of Vetter’s high quality and safety standards. Thus, the CDMO was able to increase sales by approximately 10 percent. Currently, the company employs around 3,600 people at its German, US, and Asian locations. The year was also particularly eventful for Vetter. The CDMO supported nine drug approvals of its customers, e.g. within the North American, European and Japanese markets. In the third quarter, Vetter opened a new subsidiary in Tokyo, Japan to complement the Singapore operating branch created in 2014. A few weeks earlier, the company launched Vetter-Ject®, a novel closure system for prefilled syringes for use with highly-sensitive compounds such as biologics.